Normally this is an electrical issue. Please ensure that the filter pump is plugged directly into the mains socket and not an extension lead. Please check the socket with other items to ensure this is not an issue with the socket itself. Normally caused when the item is not regularly cleaned/maintained. Back Flush the unit and replace the sand. Should I need any other tools to assemble the Sand Filter? Only a screwdriver is necessary to assemble the Sand Filter. Can I use the pool while the Sand Filter is operating? No, the swimming pool should not be used when the sand filter is operating. What can I do if there is water leaking from the strainer? Open the strainer cover, remove the O-ring and apply petroleum jelly or Vaseline over the O-ring, replace the O-ring and cover back. If this does not help, please contact your local Bestway After Sales Service point to get instructions. 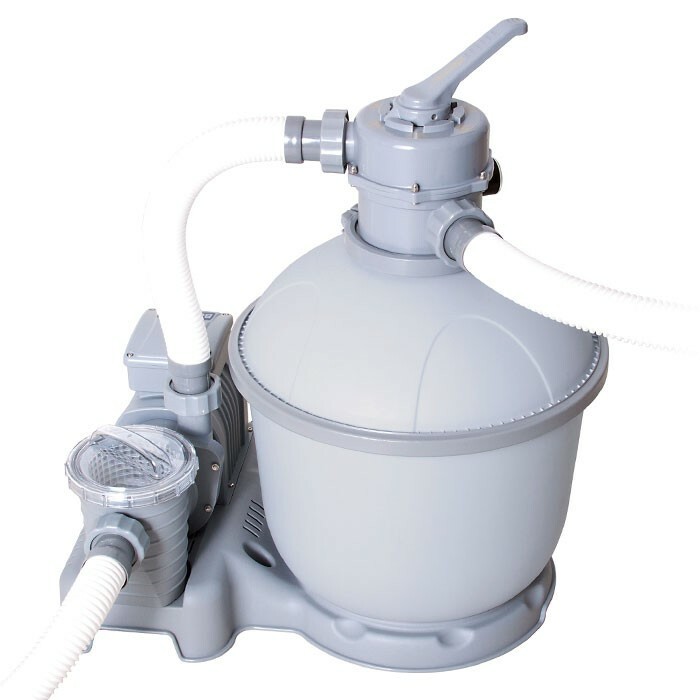 Can I use playground sand or beach sand inside Bestway Flowclear Sand Filters? No. Playground sand and beach sand or similar contain impurities and their grains size is not uniform. Which is the recommended size of sand for Bestway Flowclear Sand Filters? The recommended size of sand for Bestway Flowclear Sand Filter is from 0.45mm to 0.85 mm. The most common type is Silica #20, which is available from pool suppliers and many mass merchandisers. Using the incorrect size of sand will cause the system to malfunction and void its warranty. How often shall I change the sand in my filter? Under normal operating conditions, sand should be changed in residential filters every 4 to 5 years. In areas with high air contaminants such as dust, leaves or any condition that requires frequent back washing, the sand may need to be changed every 2 to 3 years. The reading on Pressure Gauge is higher than the recommended pressure, what can I do? After having checked the above conditions, please follow the instructions on the manual to perform backwash and rinsing. If after having performed them, there is still a high-pressure reading, sand bed replacement is necessary. All of our Sand Filter pumps come with a standard warranty period, so that you have the peace of mind that in the unlikely event you were to experience an issue, we are here to help you. Sand Filter Pumps should be plugged directly into the mains socket and not an extension lead.